On the Main River, stop in Würzburg-the “Pearl of the Romantic Road” and see the magnificent baroque Bishop’s Residenz and the largest ceiling fresco ever painted. With free time, you may want to stop in a Konditorei (German pastry and coffee shop) for a delicious local favorite and experience a German afternoon tradition! 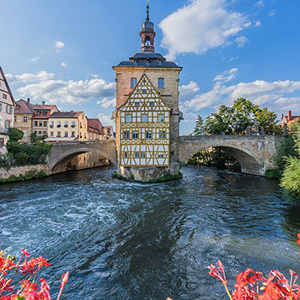 In Bamberg, marvel at the 13th-century Romanesque cathedral and the Altes Rathaus (Old Town Hall)-built on an island in the middle of the Regnitz River.